Own Barbie And Her Sisters - A Pony Tale DVD from Deff, DVD, Blu-Ray & 4K Video Specialists - Free UK Delivery..
Barbie and her sisters set off on a Swiss adventure to the majestic Alps, where they’re excited to spend the summer at a fun-filled riding academy! Barbie can't wait to find a new horse to bring back to Malibu. Stacie is super excited to prove she’s an amazing equestrian. All Chelsea wants to do is ride the big horses, and Skipper…well let's just say she’s more interested in writing about the great outdoors than experiencing it. The sis..
More animated adventures featuring Barbie. This time around, Barbie (voice of Kelly Sheridan) and her sisters, Skipper (Kazumi Evans), Stacie (Claire Maggie Corlett) and Chelsea (Alyssya Swales), travel back to their hometown of Willows to visit their grandmother. As they are looking through their grandmother's attic the girls find a map which reportedly leads to a long-lost treasure hidden somewhere in the town and, together with their..
Own Barbie & Her Sisters In A Puppy Chase DVD from Deff, DVD, Blu-Ray & 4K Video Specialists - Free UK Delivery..
Barbie in a Christmas Carol is a heartwarming adaptation of the classic Dickens story filled with cherished Christmas carols, fabulous fashions and lots of laughs! The tale stars Barbie as Eden Starling, the glamorous singing diva of a theatre in Victorian London. Along with her snooty cat, Chuzzlewit, Eden selfishly plans to make all the theatre performers stay and rehearse on Christmas Day! Not even Eden's costume designer and childho..
Get ready for Barbie A Fairy Secret, an amazing adventure with Barbie where she discovers there are fairies living secretly all around us! When Ken is suddenly whisked away by a group of fairies, Barbie's two fashion stylist friends reveal they are actually fairies and that Ken has been taken to a magical secret fairy world not far away! Barbie and her rival Raquelle take off with the fairy friends on an action-packed journey to bring h..
Join Barbie in a colourful, modern-day fairytale filled with fashion, friends and fun! Barbie and her dog Sequin jet off to visit her Aunt's amazing fashion house in Paris, and much to her surprise it's about to be shut down forever. After she discovers three enchanting Flairies with sparkle-magic powers, Barbie comes up with a brilliant idea to save the business. She even inspires Alice, a shy fashion designer, and together they create..
Barbie and Teresa tell us the fairy tale story of Liana and Alexa, best friends who share everything including their love of music. One day their simple lives change when they are given an enchanted mirror and befriend the girl trapped inside! To save their new friend, Liana and Alexa embark on a dangerous journey to the hidden Diamond Castle that will put their friendship to the test. But through the power of song and with the companio..
Barbie and her sisters set off on a Swiss adventure to the majestic Alps, where they're excited to spend the summer at a fun-filled riding academy! Barbie can't wait to find a new horse to bring back to Malibu. Stacie is super excited to prove she's an amazing equestrian. All Chelsea wants to do is ride the big horses, and Skipper...well let's just say she's more interested in writing about the great outdoors than experiencing it. 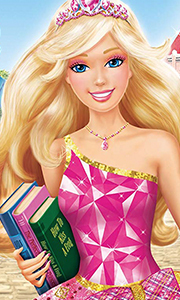 The s..
Children's animated musical adventure featuring Barbie as the shy and studious Princess Alexa (voiced by Kelly Sheridan). When Alexa is transported to a magical land after finding a secret door in the royal garden, she meets a mermaid and a fairy who warn her that the land is in danger of being taken over by the powerful ruler Malucia (Tabitha St. Germain). Can Barbie use her newly-gained friends and magical powers to put an end to Malu..
Own Barbie - Barbie and The Secret Door DVD from Deff, DVD, Blu-Ray & 4K Video Specialists - Free UK Delivery.. It's "All For One and One For All" as Barbie and her friends co-star in Barbie And The Three Musketeers! Join Barbie as Corinne, a young country girl who pursues her dream in Paris - to become a Musketeer! There she meets three girls who secretly share the same dream. Can the girls dance at the masquerade ball, transform into musketeers costumes and save the prince - all without breaking a heel? Come along on an exciting adventure that ..
Includes 19 Barbie Movies Barbie A Fairy Secret Barbie Fairytopia Barbie in the 12 Dancing Princesses Barbie Princess Charm School Barbie Island Princess Barbie as Rapunzel Barbie & the Diamond Castle Barbie Presents Thumbelina Barbie and the Magic of Pegasus Barbie and the Magic of the Rainbow Barbie Mariposa Barbie in A Mermaids Tale Barbie Mermaidia Barbie in A Fashion Fairytale Barbie and the Three Musketeers Barbie Princess and the.. Starring Barbie as Elina. Just through the rainbow in the world of Fairytopia, lives Elina, a beautiful flower fairy who longs to have wings. Her home is a large flower in the Magic Meadow where she lives with Bibble, a quirky but loveable puffball. One day Elina wakes to find that her flower home is sick, and that her fairy friends can't fly! She summons the courage to help and embarks on a fantastic journey to find Azura, a Guardian F..
Barbie As The Princess And The Pauper Barbie As Rapunzel Barbie - The Magic Of Pegasus Barbie & The Diamond Castle Barbie In The The Twelve Dancing Princesses Barbie As The The Island Princess Barbie In A Christmas Carol Barbie In The Nutcracker Special Features Dutch Subtitles (Karaoke Only)..
Own Barbie - Magic Of The Rainbow DVD from Deff, DVD, Blu-Ray & 4K Video Specialists - Free UK Delivery..
Join Barbie in a world of Butterfly Fairies! Mariposa is a beautiful butterfly fairy who loves to read and dream about the world outside her home in the land of Flutterfield. Flutterfield is protected by the Queen's glimmering magical flower lights, but when the Queen is poisoned by the evil fairy Henna, the special lights begin to go out one by one. It's up to the brave Mariposa and her friends to journey beyond the safe borders of the..
Mariposa™ and her furry friend Zee return in Barbie Mariposa and the Fairy Princess. In this magical adventure, Mariposa becomes the royal Ambassador of Flutterfield and is sent to bring peace between her fairy land and their rivals, the Crystal Fairies of Shimmervale. While Mariposa doesn't make a great first impression on their King, she becomes fast friends with his shy daughter, Princess Catania. However, a misunderstanding causes M..
Collection of animated adventures featuring Barbie. 'Barbie and the Three Musketeers' (2009) follows a young country girl who heads to Paris to start an adventure which leads to the court of the King of France. In 'Barbie and Her Sisters in a Pony Tale' (2013), Barbie (voiced by Kelly Sheridan) and her sisters jet off to Switzerland to spend the summer at their aunt's riding school nestling in the Alps. But when the future of the school..
More animated adventures featuring Barbie. This time around, it's a case of mistaken identity as Barbie, in the guise of Blair Willows, is invited to attend Princess Charm School. Once there, she's shown how to conduct tea-parties, taught how to dance, and instructed in courtly manners. But when her court teacher Dame Devin realises Blair bears a strong resemblance to the kingdom's missing princess, she stops at nothing to prevent the t..
Barbie stars as Blair Willows, a kind-hearted girl who is chosen to attend Princess Charm School. It’s an amazing place where princesses in-training learn formal dancing, tea party etiquette and proper princess manners. Blair loves her classes, her helpful magical sprites and her new friends, Princesses Hadley and Delancy. When royal teacher Dame Devin believes Blair resembles the kingdom’s missing princess, she goes out of her way to k.. THE ISLAND PRINCESS: It's time to set sail with Barbie as The Island Princess in this full-length, original musical featuring nine fantastic new songs. After being shipwrecked on an island as a little girl, Rosella (Barbie) grows up learning to talk and sing with a family of loving animals: the red panda Sagi, the peacock Azul and the baby elephant Tika. But when Prince Antonio discovers their tropical paradise, curiosity about her past..
LONG, LONG AGO in a time of magic and dragons, there lived a girl named Rapunzel who had the most beautiful, radiant hair the world had ever seen. But Rapunzel's life was far from wonderful. She lived as a servant of Gothel, a jealous, scheming witch who kept her hidden deep in a forbidding forest, guarded by the enormous dragon Hugo and surrounded by an enchanted glass wall. However, in a twist of fate, Rapunzel's discovery of a magic..
Own Barbie - Rock N Royals DVD from Deff, DVD, Blu-Ray & 4K Video Specialists - Free UK Delivery.. SING ALONG WITH BARBIE: Sing, dance and dream with Barbie and friends in her very first collection of sing-along songs from Barbie Entertainment. Easy-to-follow, on-screen lyrics let you perform your favourite Barbie songs like never before. Relive the adventure and magic from classic Barbie movie moments through twelve memorable melodies. Tracklisting: "Connected" - Barbie & The Diamond Castle "Making My Way" - Barbie and The Three Mu..
Barbie and her best friends Teresa and Renee transform from hard-working gymnasts to undercover secret agents in this exciting, action-packed adventure! When their amazing gymnastics skills catch the eye of a top-secret spy agency, the girls are soon following clues to a gem-stealing cat burglar who has escaped everyone on the case. With their high-tech gadgets, glam disguises and cute robo-pets, can they prove that smarts and teamwork ..
Own Barbie - Starlight Adventure DVD from Deff, DVD, Blu-Ray & 4K Video Specialists - Free UK Delivery..
BARBIE IN A CHRISTMAS CAROL: Barbie in a Christmas Carol is a heartwarming adaptation of the classic Dickens story filled with cherished Christmas carols, fabulous fashions and lots of laughs! The tale stars Barbie as Eden Starling, the glamorous singing diva of a theatre in Victorian London. Along with her snooty cat, Chuzzlewit, Eden selfishly plans to make all the theatre performers stay and rehearse on Christmas Day! Not even Eden's..
Barbie magically comes to life in her third animated movie, Barbie of Swan Lake. Based on the brilliant music of Tchaikovsky and the beloved fairy tale, the movie stars Barbie as Odette, the young baker's daughter who follows a unicorn into the Enchanted Forest. The evil wizard, Rothbart - intent on defeating his cousin, the Fairy Queen and taking over the Forest, transforms Odette into a swan. The Fairy Queen counters the spell, leavin..
Barbie - The Pearl Princess: Barbie stars as Lumina, a mermaid who dreams of being a princess. As long as she can remember, she's had a magical power that makes pearls dance and glow! Lumina, and her best friend Kuda, a pink seahorse, embark on an adventure to a majestic mer-kingdom. There, she uses her powers to help her friends prepare for the Royal Ball. Lumina then discovers that her magical pearls are the key to unlocking her true ..
Barbie magically comes to life through stunning computer-animated adaptation of the E.T.A. Hoffman classic. The tale begins when Clara (Barbie), receives a beautiful wooden Nutcracker as a gift from her favourite Aunt. That night the Nutcracker springs to life to ward off the Mouse King who has invaded Clara's parlour. She awakes and aids the Nutcracker, but the Mouse King shrinks her by using an evil spell. Clara and the Nutcracker set..
Barbie stars as Lumina, a mermaid who dreams of being a princess. As long as she can remember, she's had a magical power that makes pearls dance and glow! Lumina, and her best friend Kuda, a pink seahorse, embark on an adventure to a majestic mer-kingdom. There, she uses her powers to help her friends prepare for the Royal Ball. Lumina then discovers that her magical pearls are the key to unlocking her true destiny and ultimately saving..
Barbie comes to life in this modern retelling of a classic tale of mistaken identity and the power of friendship. Based on the story by Mark Twain, Barbie as The Princess and the Pauper features Barbie in an exciting dual role as a princess and a poor village girl - two girls who look amazingly alike! The girls' paths are fated to cross when Princess Anneliese is captured and Erika, her look-alike, must try to save her. Can Erika preten..
Barbie Mariposa And Fairy Princess: Mariposa and her furry friend Zee return in Barbie Mariposa and the Fairy Princess. In this magical adventure, Mariposa becomes the royal Ambassador of Flutterfield and is sent to bring peace between her fairy land and their rivals, the Crystal Fairies of Shimmervale. While Mariposa doesn’t make a great first impression on their King, she becomes fast friends with his shy daughter, Princess Catania. H.. In Barbie in The 12 Dancing Princesses, Barbie will dance her way into your hearts in this fun and enchanting adventure. Join Barbie as the beautiful Princess Genevieve and her eleven dancing princess sisters as they discover a secret entrance to an amazing, magical world where wishes come true! But when their father is in danger of losing his kingdom, Princess Genevieve and her sisters must work together in order to save the day and th..
Barbie Presents Thumbelina in a modern retelling of the classic tale. Meet a tiny girl named Thumbelina who lives in harmony with nature in the magical world of the Twillerbees that's hidden among the wildflowers. At the whim of a spoiled young girl named Makena, Thumbelina and her two friends have their patch of wildflowers uprooted and are transported to a lavish apartment in the city. Here they learn of construction plans that threat..
My Barbie DVD House all 29 films! Plus space for the next 3 films to come. Watch and play with the ultimate Barbie dvd collection. Swan Lake. Barbie Fairytopia. Barbie Mermaidia. Magic of the Rainbow. Island Princesses. Mariposa Butterfly. Diamond Princesses. A Christmas Carol. Thumbelina. Three Musketeers. A Mermaid Tale. A Fashion Fairytale. Magic of Pegasus. A Fairy Secret. Charm School. Perfect Christmas. Rapunzel. Dancing Princesse..
Own Barbie - Video Game Hero DVD from Deff, DVD, Blu-Ray & 4K Video Specialists - Free UK Delivery..
Barbie stars in another CGI-animated adventure based on a classic fairy tale. Thumbelina lives in harmony with nature in the magical world of the Twillerbees, hidden among the wildflowers. Then, at the whim of a spoiled little girl called Makena, Thumbelina and her two friends have their patch of wildflowers uprooted and are transported to a lavish apartment in the city. Here they learn of construction plans that threaten to destroy the..
Surf's up for Barbie as she returns as Merliah, the fun and fashionable surfing champion who's also a magical mermaid princess! In this exciting sea-quel, Merliah makes a splash when she heads to Australia for the ultimate surfing competition. When the evil mermaid Eris escapes from her whirlpool , with plans to take over the throne of Oceana, Merliah and her sea friends dive in to stop her. It's a fresh new adventure where Merliah lear..
Barbie stars as Merliah, a surfing champion from Malibu. One minute she's a normal teenager and the next she learns a shocking family secret: she's a mermaid! Merliah and her dolphin friend Zuma set off on an undersea adventure to rescue her mother, the queen of Oceana. With help from her new mermaid friends, Merliah saves the ocean kingdom. In the end, she discovers what makes you different can also be your greatest strength. Special ..
Join Barbie and her sisters, Skipper, Stacie and Chelsea as their Christmas holiday plans turn into a most unexpected adventure. After their plane to New-York is diverted by a snowstorm, the girls find themselves stranded far from their destination and their holiday dreams. Ending up at a remote inn in the tiny town of Tannebaum, the sisters discover new friends and magical experiences. To thank everyone for their heart-warming welcome,..
Own Barbie - Dolphin Magic DVD from Deff, DVD, Blu-Ray & 4K Video Specialists - Free UK Delivery..
Own Barbie - Dreams Come True DVD from Deff, DVD, Blu-Ray & 4K Video Specialists - Free UK Delivery..
Own Barbie - Fairytopia / Mermaidia / Fairytopia - Magic Of The Rainbow DVD from Deff, DVD, Blu-Ray & 4K Video Specialists - Free UK Delivery..
Join Barbie as Elina in an all-new Fairytopia adventure! Elina travels with her puffball Bibble to Fairy School at the magnificent Crystal Palace. There, she meets the other fairy apprentices, chosen to learn the annual Flight of Spring and magically create the first rainbow of the season. But when the evil Laverna tries to stop the Flight, threatening to plunge Fairytopia into ten years of bitter winter, Elina and her new friends must ..
Mariposa and her furry friend Zee return in Barbie Mariposa and the Fairy Princess. In this magical adventure, Mariposa becomes the royal Ambassador of Flutterfield and is sent to bring peace between her fairy land and their rivals, the Crystal Fairies of Shimmervale. While Mariposa doesn’t make a great first impression on their King, she becomes fast friends with his shy daughter, Princess Catania. However, a misunderstanding causes Ma.. In this follow-up to Fairytopia, Elina (played by Barbie) travels to Mermadia to save her friend Nalu, the merman Prince. Prince Nalu has been kidnapped in an attempt to learn the whereabouts of a special berry that will make Laverna the most powerful fairy in Fairytopia - even more powerful than the Enchantress! It's up to Elina to stop them, but she can't do it alone. She'll need the help of Nori, a headstrong mermaid who doesn't trus..
Own Barbie - Party With Barbie DVD from Deff, DVD, Blu-Ray & 4K Video Specialists - Free UK Delivery..